The Shuswap Watershed Council wants to make it easier for you to learn about the water quality in our watershed. 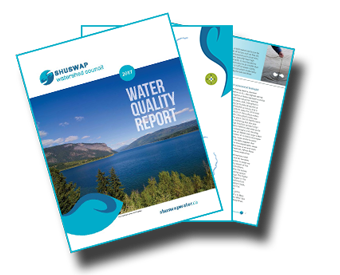 The SWC has completed its second annual report on water quality in the Shuswap watershed: see Water Quality Summary Report for 2017. The summary report for 2016 can be found here. Water quality reports for the Shuswap watershed were also developed in 2012 and 2013 by the Shuswap Lake Integrated Planning Process. Find the SLIPP reports. Much of the water quality data that is collected in the Shuswap watershed – and all across the province – is kept in a provincial government database. The database is called the “Environmental Monitoring System” or EMS. You can access water quality data from it using a web reporting tool. We know that using a database can be overwhelming and frustrating. We’ve produced a step-by-step user guide to help get you started. To accompany the user guide, you can also check out these Environmental Monitoring System maps that display the names of monitoring stations across the watershed. Check out the Water Quality Data User Guide. In 2017 the SWC initiated a water quality monitoring project in Shuswap Lake to test for the presence of substances called nonylphenols. Nonylphenols are a group of synthetic (man-made) compounds found in many industry and consumer products such as detergents, shampoos, cosmetics, lubricants, plastics, rubbers, paints and more. Nonylphenols can be toxic and persistent in the environment, and harmful to algae, invertebrates and fish. They are not routinely monitored in fresh water by environmental regulators. Because of the occurrence of nonylphenols in such a variety of household consumer products, it’s quite possible that household wastewater contains small amounts of the substances. That possibility, combined with the awareness of nonylphenols’ potential harmfulness to lakes and rivers (but no current understanding about them in the Shuswap) is what led the SWC to initiate this special monitoring project. The results of the monitoring project, which ran from spring to fall 2017, were very good. The monitoring involved taking samples at various locations in Shuswap Lake (Salmon Arm Bay), and from the Salmon Arm Wastewater Treatment Plant. Nonylphenols were not detected in any samples taken from the lake; a trace amount of one kind of nonylphenol was detected in the treatment plant effluent samples. These monitoring results suggest that nonylphenols are entering the lake via treatment plant effluent, but in such minuscule amounts that sophisticated water quality analysis can’t detect or measure their presence in the lake. The Canadian Water Quality Guideline for the Protection of Aquatic Life sets the guideline for nonylphenols in fresh water at 1 microgram per litre, and Shuswap Lake is well within that limit. The Shuswap Watershed Council thanks the City of Salmon Arm and the BC Ministry of Environment and Climate Change Strategy for their support and participation in this monitoring project. For more information, see the SWC’s media release Shuswap Watershed Council’s monitoring project shows good results.